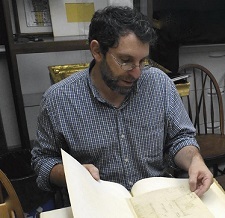 Scott Paul Gordon came to Lehigh University in 1995 and is currently the Andrew W. Mellon Chair at Lehigh. He teaches courses at the undergraduate and graduate level in eighteenth-century transatlantic literature and in literary and cultural theory. He has served as the Director of the First-Year Writing Program (2003-2006), as Director of Lehigh University Press (2006-2011), and as chair of the Department of English (2011-2016). In 2002 Gordon received the Lindback Award for Distinguished Teaching and was named a Class of 1961 Professor for the years 2002-2004. Gordon’s first projects focused on seventeenth- and eighteenth-century British literature: The Power of the Passive Self in English Literature, 1640-1770 (Cambridge University Press, 2002) and The Practice of Quixotism: Postmodern Theory and Eighteenth-Century Women's Writing (Palgrave, 2006). His current research focuses on early America, in particular the Moravian experiment in Pennsylvania. His edition of the vast correspondence of Mary Penry (1735-1804), who immigrated from Wales in 1744 and lived as a single sister in Moravian communities at Bethlehem and Lititz for nearly fifty years, will be published by Penn State University Press in 2018. Another project focuses on religion, social ambition, and patriotism in colonial and revolutionary Pennsylvania by exploring the lives of “worldly Moravians.” Pieces of these projects have appeared in The William and Mary Quarterly, The Pennsylvania Magazine of History and Biography, Early American Studies, and The Journal of Moravian History. In 2010 the Jacobsburg Historical Society published Gordon’s study of the Delaware chief Gelelemend (1737-1811), titled Two William Henrys: Indian and White Brothers in Arms and Faith in Colonial and Revolutionary America.